Halifax have bolstered their selection options for 2017 after signing a dual registration agreement with Super League outfit Salford Red Devils. 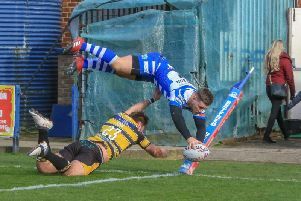 The deal is expected to give Fax boss Richard Marshall access to the Reds players not selected by their coach, the former Fax half back Ian Watson. It replaces the two year arrangement with relegated Hull KR, which was a limited success during the 2015 season, with only half back Connor Robinson, who went on to complete a permanent move to the Shay, and forward Jordan Cox, who made just one appearance, making the journey from Craven Park. The Reds are currently only scheduled to run a first team next season, potentially opening the door for a much heavier flow of player traffic between the two clubs. “I think it’s an arrangement that can benefit both teams,” said Marshall. “We’re running with a squad of 24 players next season, and four of them are under 20 and relatively inexperienced at Championship level. “If you factor in two or three injuries at any one time, you can see how important it is that we give ourselves some options. “The situation for our players is the same as always; if we have a player who is killing it in the reserves, I will always look at them first. “But dual registration can work for Championship teams; look at Featherstone last year, with three or four Leeds players coming into their team at crucial times. “Salford are probably in a position where they’re going to be sitting down players each week and they also have some younger players who are contracted to them with nowhere to play at the moment. The relatively close relationship between Marshall and Watson will be key to making the deal “work”, with the pair having coached at together at Swinton before managing the dual-reg agreement between the Lions and Warrington, albeit with Marshall as the senior partner. “We’ve got some experience of this, both the benefits and the pitfalls,” said Marshall.